An entrepreneurial spark can strike when you least expect it. For Margie Moroney, it was at age 52 when, after spending her years working as an investment banker she decided to embark on fitting the next piece of the jigsaw puzzle in place. She recent came to our campus to give a guest lecture about her lessons learned. 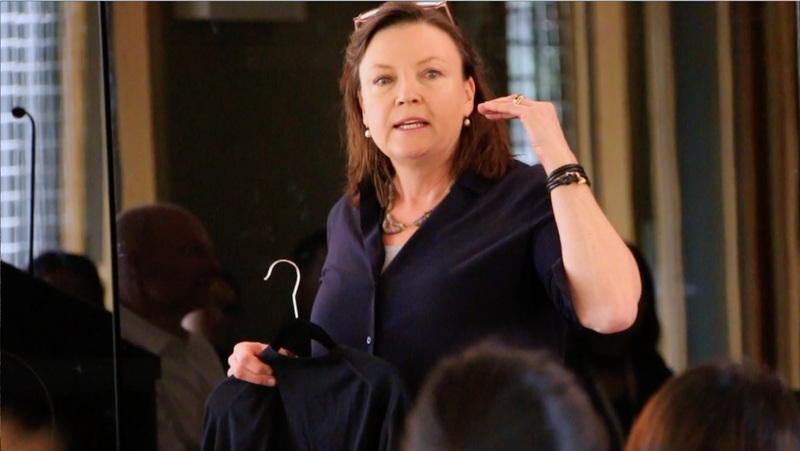 Driven by a wealth of knowledge in agriculture and a desire to bring the wool market a product it so desperately lacked, Margie founded HOLOS Luxury Knitwear in 2012 as a solution to seeking out luxury wools in the fashion industry that bridges the gap between standard wool and cashmere. Her years of working on the numbers side of various agricultural projects allowed Margie to identify the prospect of developing a market for merino wool which is rarer and more luxurious than cashmere. It all came down to the thought that, in this crowded world, there is always an opportunity to go tap into something new and unchartered. Margie’s idea was driven by her desire to deliver a product that would sell itself once it gained the right kind of exposure. She held on to this idea for 25 years, following which she delved deep and made her move. Margie’s long held passion for agriculture and her experience in agribusiness put her in good stead to formulate a set of business guidelines that would not only thrive in the market but create social good. The focus was drawn from a mindfulness of social finance – where profit is not the only goal. Margie’s enterprise made enough profit to run itself, starting out selling to a ‘natural network’ of family and friends, before moving on to a larger market. Here, their emphasis was on quality. Having a lower profit margin made their price more competitive and created brand trust. Margie’s answer: do the right thing, because it’s the right thing – not just because of the consequences. Strong, tangible ethics go a long way. Quality falls at the crux of Margie’s business model. As such, the line offers a repairs and maintenance service to ensure the longevity of HOLOS products. They work closely with farmers and manufacturing partners, creating valuable and loyal relationships along the way. Margie reveals that the ideal qualities in an entrepreneur are creativity, efficient communication and being well equipped with a tool kit for handling issues as they arise. However, there’s only so far you can go on your own. There’s no denying that the startup world can get very hectic very quickly, and according to Margie, bringing in the troops to help out when you reach your limits and offer a different set of skills to complement your own is essential. While Margie knows the merino wool game like the back of her hand and could do the finances in her sleep, she’s recruited a sales executive to provide a fresh take on marketing the luxury merino wool to its full potential. She’s living proof that no matter the age or stage, it’s never too late to start and if you hold on to a dream for long enough, it will manifest itself in a passion worth acting on. Learn more about HOLOS Luxury Knitwear.